Review: Tom Cruise's 'Oblivion' Presents a Beautiful Vision of the End of the World | Radical Studios, Inc.Radical Studios, Inc. I could easily spoil the vast majority of Oblivion merely by listing the various science fiction films from which it cribs. From visual cues to plot beats and character arcs, it feels like a mash-up of the various high-profile science fiction thrillers from the last few decades. But almost despite itself, the film works anyway as its own beast. Yes the characters are thin and the screenplay doesn’t have too much going on underneath the hood, but the film is an absolute visual delight. Universal originally planned to release this film in America last Friday for an exclusive IMAX-only week-long engagement and it’s easy to see why. The film features absolutely fantastic special effects, yet offers the pleasure of being able to believe your eyes more often than not. Director Joseph Kosinski’s Oblivion may be a triumph of style over substance, but the picture *is* a triumph of style, with strong acting that helps overcome the lack of substance. Sometimes visual imagination coupled with strong acting is enough. The end of the world never looked so beautiful. The picture is of course a vehicle for Tom Cruise, and he’s quite good here per-usual. There are only a handful of prominent speaking roles and the film refreshingly takes its time establishing its world before getting to the plot. And yes, the opening reel or so truly does feel like a live-action version of Wall-E, with Cruise flying around the deserted planet fixing stuff and pining for our lost home (long story short, Earth got invaded and we nuked the Earth in order to repel the invasion). The futuristic ships and gadgets are themselves a visual delight, with glorious shots of Cruise piloting his ship literally over the clouds. Despite the film’s $120 million budget (it looks like it cost far more, and I say that as a compliment) and various futuristic special effects, it’s most special effect is its use of practical locations. It is frankly a different kind of post-apocalyptic film in that it almost revels in the idea of an Earth uncontaminated by humans (and mostly void of animals to boot). Its soaring vistas and epic natural terrains bring to mind something akin to Alan Weisman’s The World Without Us. If it needs to be said, if you’re going to seeOblivion, see Oblivion in IMAX at all costs. On a narrative level, the picture is refreshingly patient, slowly peeling back the curtain to reveal its grand designs, with neither the need to rush into action or spoil all of its major story beats at one time. This is the kind of screenplay I always appreciate, one where story is still being told right up to the end. Detailing the picture’s thematic text would count as a spoiler, so I’ll merely say that the film plays around with classic science fiction concepts without over-stuffing itself with implied deeper meaning. Truth be told, I appreciated the comparative lack of ambition. Oblivion isn’t trying to set up a franchise that will spawn sequels and spin-offs in various mediums. In fact, it’s refreshingly close-ended, telling a full story that actually ends at the end. Oblivion isn’t trying to be the biggest would-be blockbuster of the year (it is sparse with its action), it merely wants to tell a simple character journey set in the most gorgeous post-apocalyptic wasteland you’ve ever seen. Kosinski, with the help of cinematographer Claudio Miranda, seems desperate to prove that Tron: Legacy wasn’t entirely his fault, showing restraint and moderation where the prior film emphasized lights and smoke to hide its inherent hollowness. Tron: Legacy was frankly one of the worst would-be blockbusters I’ve seen in the last several years. Oblivion is certainly an improvement. Oblivion is a solid and engaging science-fiction drama. It is less concerned with over-the-top thrills than in establishing time and place while telling a somewhat simple story of self-discovery. It has just enough ideas to justify its narrative journey, and only enough action beats to construct a solid trailer (the film has one very strong second-act chase scene). As a Tom Cruise vehicle, it again shows off why he has remained one of the biggest stars in Hollywood through thick-and-thin, as it shows his unwillingness to deliver a product anything below rock-solid (I’ll assume Rock of Ages was a statistical anomaly). 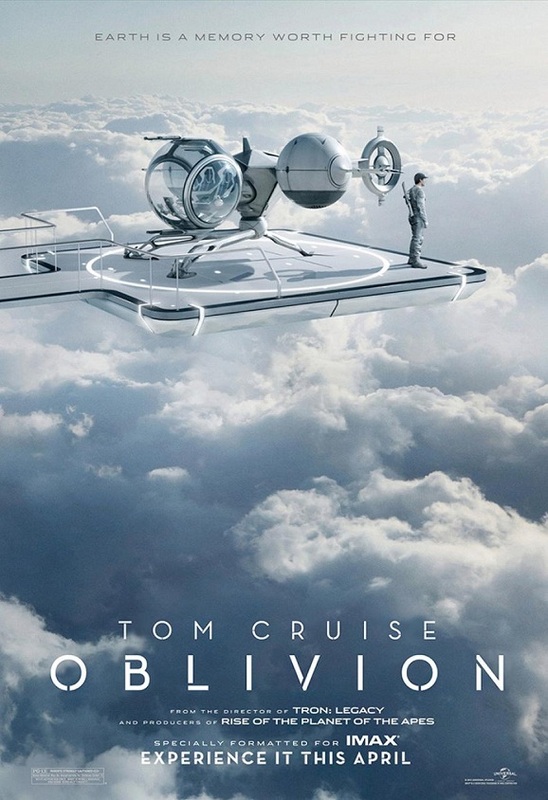 If Tron: Legacy represented basically everything wrong with the modern blockbuster, Oblivion presents a more optimistic spectacle: Thoughtful, patient, rooted in performance, intended for glorious IMAX 2D, and using its special effects to support the narrative rather than suffocate it. Oblivion is not a great film but it is completely solid big screen entertainment that does its job with visual enchantment to spare.